Argentré du Plessis is located in the Department Ille et Vilaine in the Eastern part of Brittany (Figure 2). The climate is oceanic, with average yearly rainfall of 700-800 mm, and with some summer droughts during recent years. The average temperature is about 15 °C, with few very warm or very cold days. In the most Western part of Brittany, yearly rainfall is above 1100 mm. Figure 2. Case Study Site location within Ille et Vilaine (Department 35 in the map of France). Brittany is very agricultural and dynamic. Agribusiness is the main source of employment in the region. The main products are cow milk, especially in the department Ille et Vilaine, pork, especially on the Armor coast, and poultry around Morbihan. Beef is also well represented. Vegetables are mainly grown along the coast, and in the central part of Brittany. All sectors are well organised and nowadays assistance is provided to develop short selling chains. The Breton farming is well known for its technical performance and for it level of intensification. The canton of Argentré du Plessis has the strongest concentration of animals within Ille et Vilaine. In Brittany, there is a large shortage of cereals and proteins compared to the needs of the animal sector. This imbalance has created problems of surplus organic fertilizer given the limited available areas where they can be applied. Extensive cropping of maize and cereals have created problems in relation to the use of plant health products. The soils in Brittany are subjected to high erosion rates, as evidenced by the concentration of phosphorus in water reservoirs. Brittany is also a popular tourist area. The Gaec de la Branchette is under biologic agriculture since 1998, following several years of intensive cultivation (milk, bulls, pigs). The farm is located in the drainage basin of the Haute Vilaine. The main product is cow milk on the basis of feed based on herbs. The pasture is composed of associations of grasses and legumes, which are grazed for 10-11 months per year. Pastures are on average kept for 7-9 years. Following one or two stubble treatments with a toothed Canadian type cultivator, plowing to a depth of 15-20 cm deep is made to incorporate crop residues and to avoid that less fertile soil comes to the surface. Maize is planted in May and two to three mechanical weedings are done with harrow, rotary hoe and hoe. The maize harvest takes place in early October to free the land just in time for the sowing of cereals with or without protein crop. The rotation ends with the establishment of grassland after the harvest of cereals in July-August. On the plots that are more distant from farms, grasslands are kept for shorter periods (3-4 years). Livestock is fed from the farm and very little food is brought in from outside (wheat bran). Winter feeding is balanced with maize and grass harvested before and stored as dried fodder (alfalfa, red clover). The advantage of the system is its simplicity for feed, and the outstanding work organization allows everyone to take several weeks per year off. The majority of the soils in the region are deep silty clay loams. In the north-east corner of the map, the Pertre forest dominates the surroundings with an elevation of 131 m. This forest is located on leucogranites. Anticlinals and synclinals of Brioverian age are also present on the study farm. The Paleozoic and Brioverian rocks are structured in straight folds that were opened during NS shortening of the Hercynian orogeny, associated with a generalized shear of central Brittany between two adjacent steps (North and South Armorican faults). A final event is responsible for the reactivation of the discordance and for the overlap on the southern flank of the Pertre granites. Magmatism is represented by the Pertre Massif, which is leucogranitic with concentric structure, and which was intrusive in the Brioverian rocks, causing metamorphism of these. This massif dates to the Upper Devonian. Its formation was accompanied or followed by acid and basic subvolcanic episodes arranged in vein fields (field Visseiche, dome Louvigné de Bais) intersecting the Brioverian of the region as well as the Pertre Massif. Metamorphism that has in places been detected in Brioverian rocks indicates that other non-outcropping plutonic masses exist at relatively shallow depths. Only the Seiche and its main tributary, the Quincampoix developed alluvial systems from which currently there remain only a few scattered fragments and terraces corresponding to incision of rivers during the Pleistocene. In the Atlantic period the colluvial slopes were formed as well as the valley bottoms and peat. Farming practices and intensive cultivation of crops have led to a deterioration of soil quality especially with the accumulation of certain minerals such as phosphorus, nitrate leakage and reduction of structural stability due to the absence of grasslands in many rotations (maize / grain). Rivers in the region have quality problems either because of nitrate or because of pesticides. Governments and Europe encourage changes in practices by funding research activities or development aimed at improving their environmental impact. Many actions are conducted on watersheds such as that of the Haute Vilaine which directly concerns the Gaec de la Branchette. They participate in the transfer of technical alternatives to conventional farmers. The Grenelle Environment and the Bio Ambition Plan aim to accelerate the development of organic agriculture. In 2012, 1800 farmers in Brittany produced organically; this is 5% of all producers. A quarter of the producers is located in Ille et Vilaine, which means 1 organic farmer for every two traditional farmers in the department. Many activities have been undertaken to slow down the soil degradation. 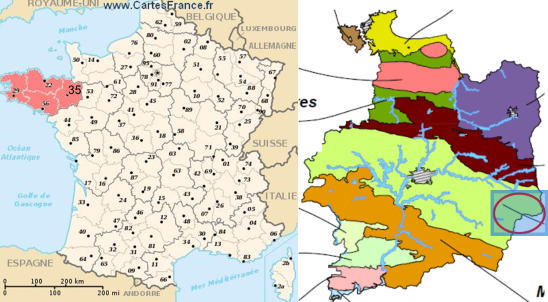 Brittany and the Department Ille et Vilaine are included in a number of these studies.